In The Hard Hand of War, Mark Grimsley addresses the evolution of Union military policy towards Southern civilians and specifies three separate phases of policy: conciliatory, pragmatic, and hard war. This policy changed with the Union’s changing war aim from the defense of the Union to the abolition of slavery and every stepping stone in between. The hard war policy came to a head after the failure to break the Confederacy by both respectful occupation and concentration on the battlefield. For hard war, the focus shifted to the destruction of the Confederate infrastructure and the confiscation of private citizens’ property, especially those who outright supported the Confederate cause. In 1863, the United States War Department published General Order No. 11, also known as Lieber’s Code. This publication provided the justification of hard war by means of military necessity – the harder the war, the shorter it will be. It did not permit “wanton destruction”, which inhibited the return to a state of peace and reconciliation (150). More importantly, the Code left the acceptable range of actions taken against civilians considered as rebellious enemies, and thus the distinction of pragmatic war versus hard war, up to the discretion of military commanders. For General Sherman, hard war was embodied in the strategy of raids employed by Grant in 1864. Chevauchées aimed provide for the pillaging troops, improve their will to fight, decimate the enemy’s land, and destroy the enemy both politically and psychologically. 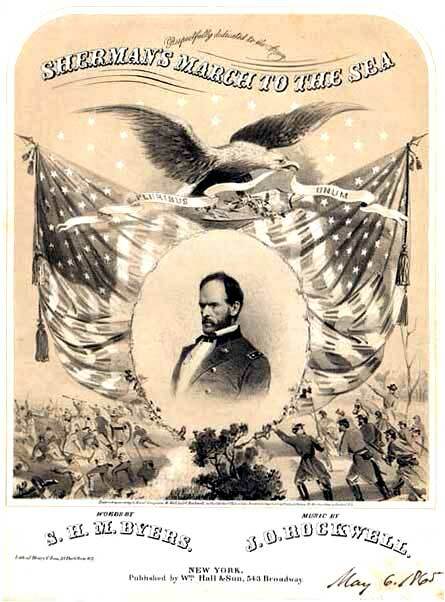 Sherman’s aim for his March to the Sea was to show Jefferson Davis the Union power “which [he] cannot resist” by marching through his territory and “desolating the land” (191). Originally, Sherman was not completely comfortable with the idea of hard war and pillaging as a military necessity. He saw pillaging as a crime punishable by death, an opinion shared by Francis Lieber, the namesake of the Lieber Code. Lieber, however, saw a difference between pillaging done by uniformed troops and pillaging done by “self-constituted guerrillas” – only the latter is punishable by death. The former would be treated as “ordinary belligerents” (148). However, Sherman became accustomed to hard war tactics and supported them as retribution for the Confederacy forcing the Union into a war.